Only a few days after the 42nd anniversary of the Roe v. Wade decision, Family Planning Advocates of New York State held their annual Day of Action on Jan. 26 in the statehouse building. 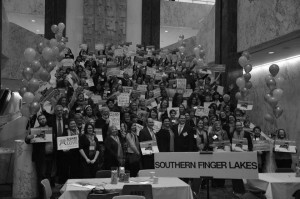 Despite a harsh snowstorm in the forecast, advocates from every corner of New York and from a wide range of ages gathered in Albany to make their voices known to senators and assembly members on matters of women’s equality and reproductive healthcare. Donning bright pink scarves and ties, their colorful presence brightened the corridors of the Capitol. Participants congregated in an open hall centered around a sweeping granite staircase, a part of the statehouse known as The Well. Planned Parenthood affiliated educators tabled with information on contraceptives and other health center resources. Community educator Leah Addario of Glens Falls, New York, spoke of the high teen pregnancy and sexually transmitted infection rates plaguing Albany, as well as the atmosphere of being employed in a field where opposition makes itself known on sidewalks outside of the workplace. A featured discussion point of the day was the Women’s Equality Agenda, which addresses widespread concerns, from accommodations for pregnant women in the workplace to the end of housing discrimination against domestic violence victims. In the New York State Senate, the WEA has been passed for all but the bill’s final plank on reproductive rights. This deletion has created a standstill in the New York Assembly, which will not attempt to put the agenda through until all of the provisions have been passed in the Senate. The final plank, guaranteeing a woman’s access to safe and legal abortion, is intended as a protection against any decisions made at the federal level. It would secure reproductive freedoms to New York women in the case of Roe v. Wade ever being overturned. Christine Sadowski, executive director of the Orange County’s Young Women Committed to Action, spoke of the conflict that this halted situation creates. Additional legislation in the works with ties to women’s equality include the Boss Bill and Paid Family Leave Insurance Act, as well as senator and assemblymen membership to the New York State Bipartisan Pro-choice Legislative Caucus. The Boss Bill is intended as protective means from decisions similar to the Hobby Lobby ruling, granting women the freedom of choosing their reproductive health care without having to worry about losing their job as a result. Paid Family Leave would relieve employees of the difficult and unavoidable choice between staying at home to provide care to a family member and going to work to provide financial stability. Currently the NYS Bipartisan Pro-Choice Legislative Caucus has more than 70 members and intends to create a community that maintains and encourages women’s access to comprehensive reproductive healthcare. New York State Sen. Liz Krueger, one of the members taking part in that dialogue, said she is confident in the future of New York’s reproductive legislation, despite the hurdles these bills are facing. Liz Alexander is a freshman environmental science major who is tired of politicians trying to regulate her body. You can email her at ealexander@ithaca.edu. Editorial Note: Liz Alexander participated in the Day of Action event in Albany.